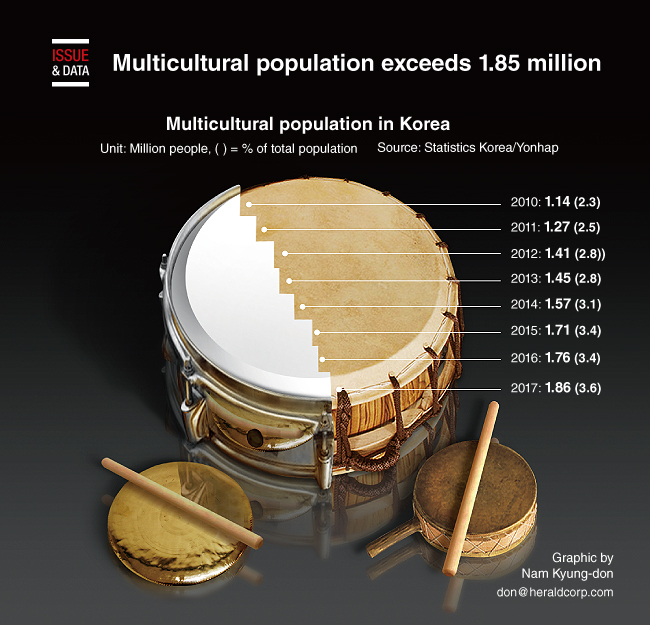 According to the 2017 data from Statistics Korea, people from multicultural backgrounds residing in the country totaled 1,861,084 as of Nov. 1, 2017, up 96,420, or 5.5 percent, from a year ago. The number, which accounts for 3.6 percent of the country’s total population of 51,422,507, broken down to 1,479,247 long-term foreign residents (79.5 percent), which includes migrant workers; 212,302 children who were born in the country (11.4 percent); and 169,535 naturalized citizens (9.1 percent). Chinese nationals made up the largest portion of the total, with 709,828 (47.9 percent), trailed by Vietnam, Thailand, Uzbekistan, the Philippines, Cambodia and the United States, the data showed.